I made this blended background ages ago, it was just hanging out in one of my folders. This week, I thought it needed a butterfly! 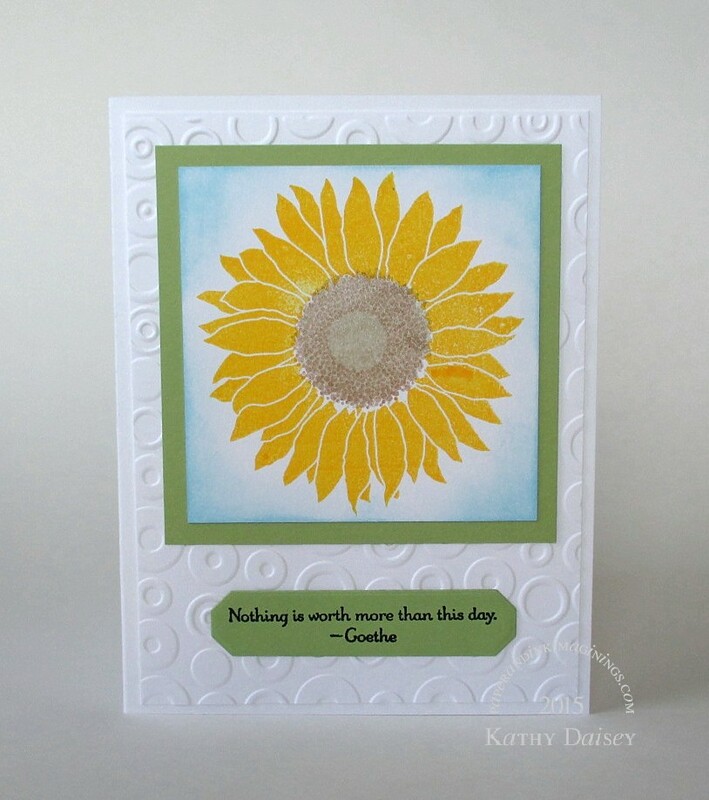 Supplies: Stamp – My Favorite Things, paper – Neenah Classic Crest Solar White, Stampin’ Up! Night of Navy, Stardream Metallic Flame, Strathmore Bristol, inks – Tim Holtz/Ranger Distress Ink Blueprint Sketch, VersaFine Clair Twilight, dies – Hero Arts (butterfly), Lawn Fawn (stitched rectangle), Simon Says Stamp (banner), stencil – Heidi Swapp, embossing powder – Stampendous Detail clear. 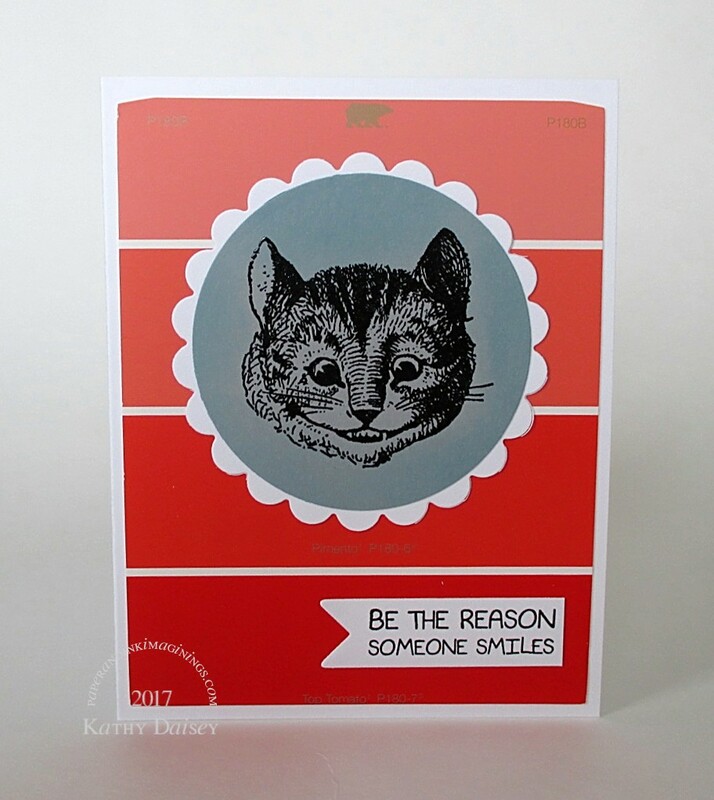 Categories: card, caring, encouragement, I love you, inspiration | Tags: card, Heidi Swapp, Hero Arts, Lawn Fawn, My Favorite Things, Neenah, Ranger, Simon Says Stamp, Stampendous, Stampin' Up!, Stardream, Tim Holtz, Tsukineko, VersaFine Clair | Permalink. 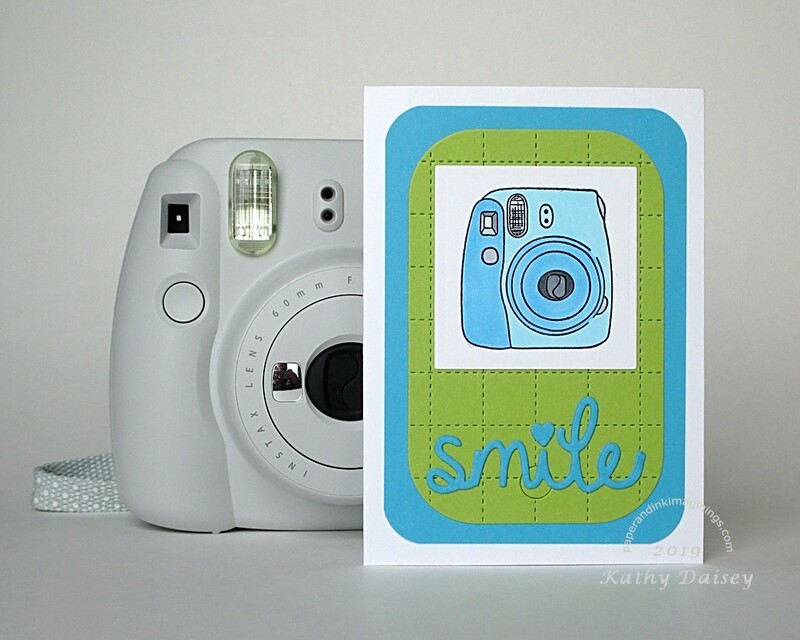 A card with a “smile” sentiment is always good to have in your stash. Supplies: Stamp – Altenew, paper – Neenah Classic Crest Solar White, PopTone Sour Apple, Stampin’ Up! Tempting Turquoise (retired), inks – Copic B0000, B00, B02, C3, C5, C7, VersaFine Onyx Black, dies – Reverse Confetti (quilted tag), Spellbinders (square), Taylored Expressions (smile), corner rounder – Stampin’ Up!, embossing powder – Stampendous Detail clear. 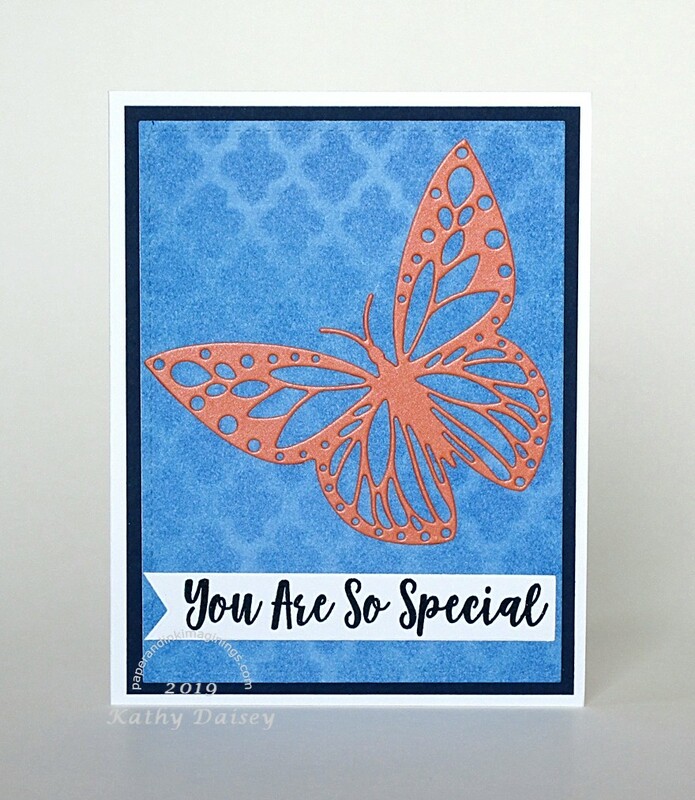 Categories: card, encouragement, inspiration | Tags: card, Copics, Neenah, Poptone, Reverse Confetti, Spellbinders, Stampendous, Stampin' Up!, Taylored Expressions, Tsukineko, VersaFine | Permalink. 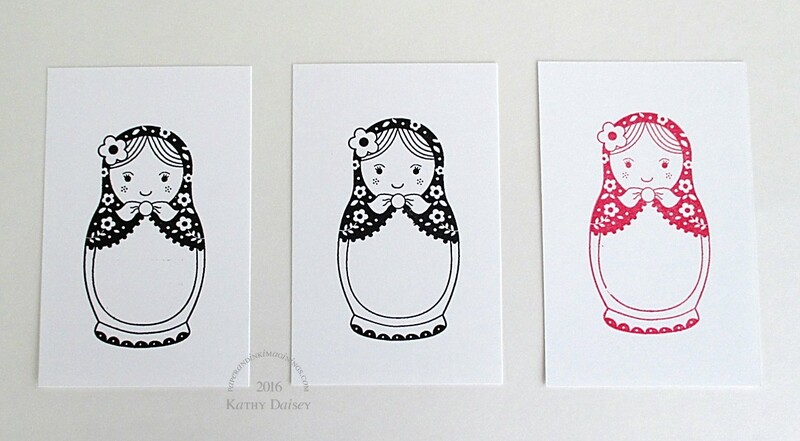 I was searching for the PERFECT stamp set of cats/kittens over the weekend. I think I have my choices narrowed down, almost ready to buy. But I wanted to stamp a cat NOW. So, I dug through Offspring3’s stash of crafting supplies for the Cheshire Cat. I have actually been inside of Home Depot 3 times in the last week – and only grabbed paint chips one of those visits. We are starting the process of redoing the kitchen, so I will be a frequent visitor to Home Depot and Lowe’s for the next month or two. Supplies: Stamp – Her Majesty (The Queen’s Ink), paper – Behr (Home Depot) paint chip, Neenah Classic Crest Solar White, Stampin’ Up! 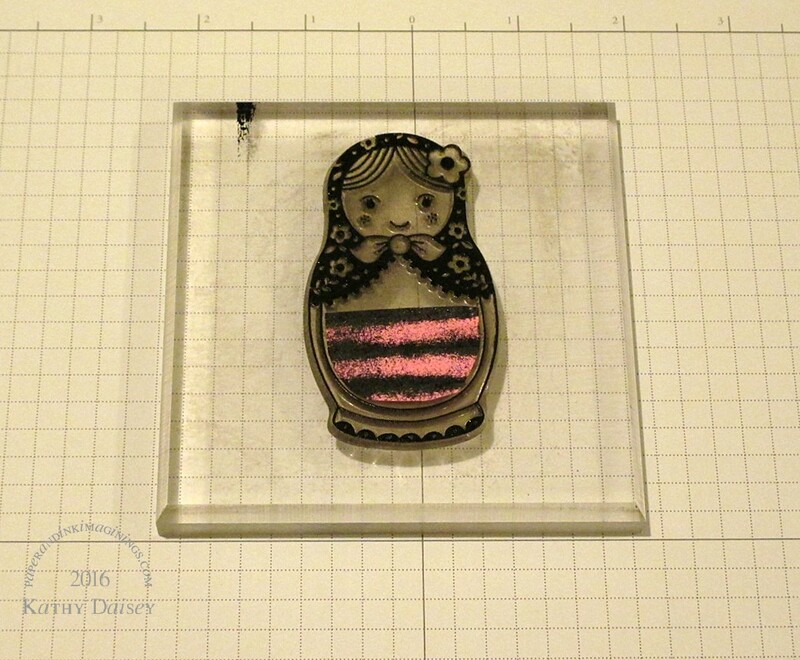 Smoky Slate, ink – Tim Holtz/Ranger Distress Ink Tumbled Glass, VersaFine Onyx Black, dies – Spellbinders (circles), Taylored Expressions (banner), embossing powder – Filigree Fine Art Powder clear. Categories: card, caring, encouragement, inspiration, thinking of you | Tags: card, Her Majesty, paint chip, Ranger, Simon Says Stamp, Spellbinders, Stampin' Up!, Taylored Expressions, Tim Holtz, Tsukineko, VersaFine | Permalink. Really, can you not giggle when you see a dachshund running with ears flying? Supplies: Stamps – Lawn Fawn, Simon Says Stamp, paper – Neenah Solar White, Stampin’ Up! Chocolate Chip, Painted Blooms DSP, Taylored Expressions Build A Scene, inks – Copic E23, VersaFine Onyx Black, dies – Lawn Fawn, embossing powder – Filigree Fine Art Powder clear, twine – We R Memory Keepers. Categories: card, encouragement, inspiration, thinking of you | Tags: card, Copics, Lawn Fawn, Neenah, Simon Says Stamp, Stampin' Up!, Taylored Expressions, Tsukineko, VersaFine, We R Memory Keepers | Permalink. Last week, I posted a Stacking Dolls Card, and lamented within the post that the big doll had lines on her apron. 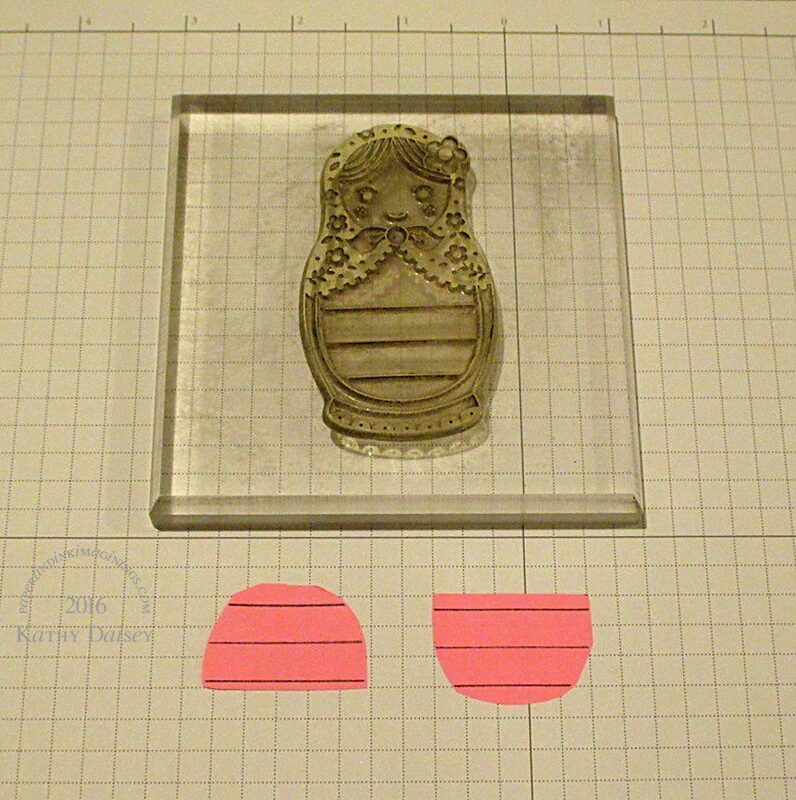 And how I wanted to cut the lines out of the stamp, because how could I ever mask the lines off of that apron? Yes, I bailed out. 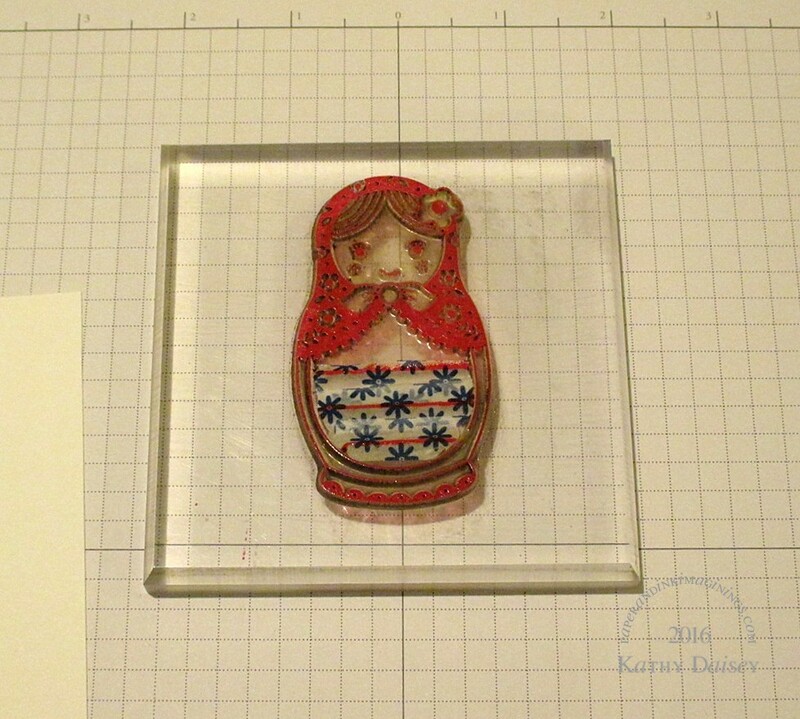 I assumed that I would not be successful masking the lines of the largest Russian Doll stamp, so I never even tried. Encouraged by Cobs from The Cobweborium Emporium and Gillian from PaperPuff, I set out to mask the lines. 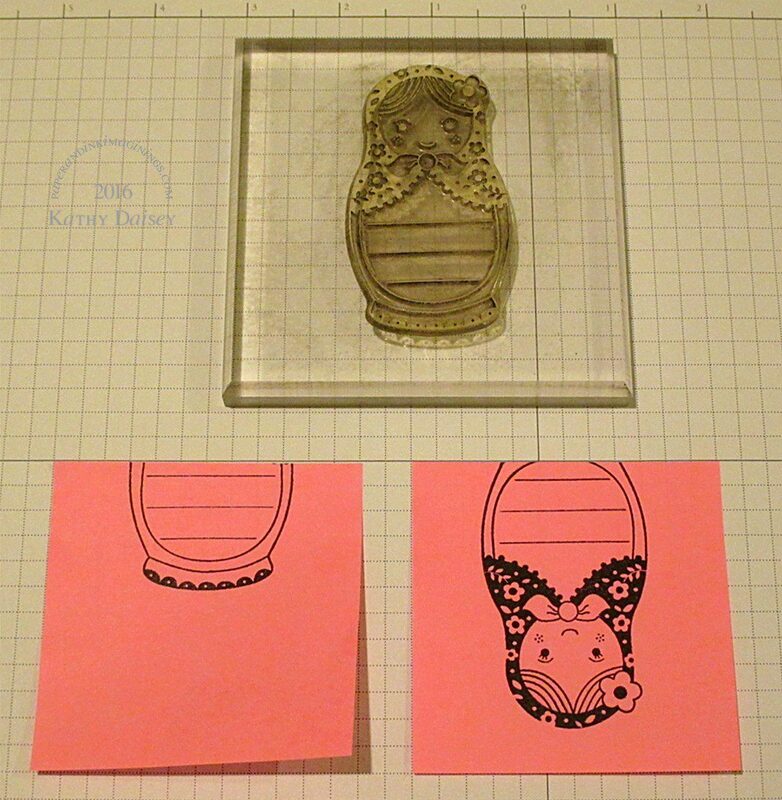 Step 5 – remove the mask before stamping. Alternately, I tried using washi tape as well. 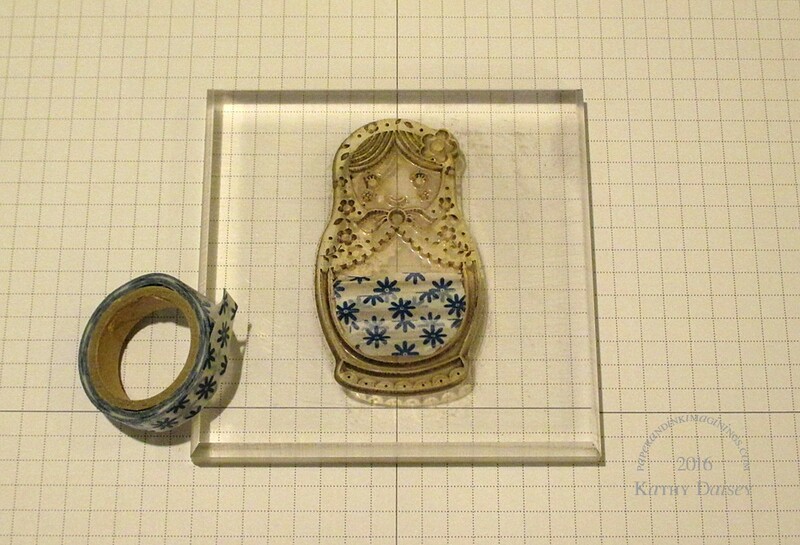 Step 5 – remove the washi tape before stamping. If you look closely at the stamped dolls at the top, you can see I went 1 for 3 for “perfect” image. The one on the left, I must have inked the post it note too heavily, and the ink bled through the paper and the lines stamped anyway. The red one has a tiny little blank spot around the apron from a tiny piece of trimmed washi tape hiding on the stamp surface. Thanks to Cobs & Gillian for the push to JUST DO IT! Supplies: Stamp – Hero Arts, paper – Neenah Classic Crest Solar White, ink – VersaFine Onyx Black, Satin Red, washi – Recollections. Categories: inspiration | Tags: Hero Arts, Neenah, Recollections, Tsukineko, VersaFine | Permalink. We have had several days of drop dead GORGEOUS September weather – a little warm, but clear blue sky, abundant sunshine. I saw this sunflower image in my scrap heap, and realized it needed to be in a patch of blue sky. And I dug out this Goethe quote from an old Stampin’ Up! set. 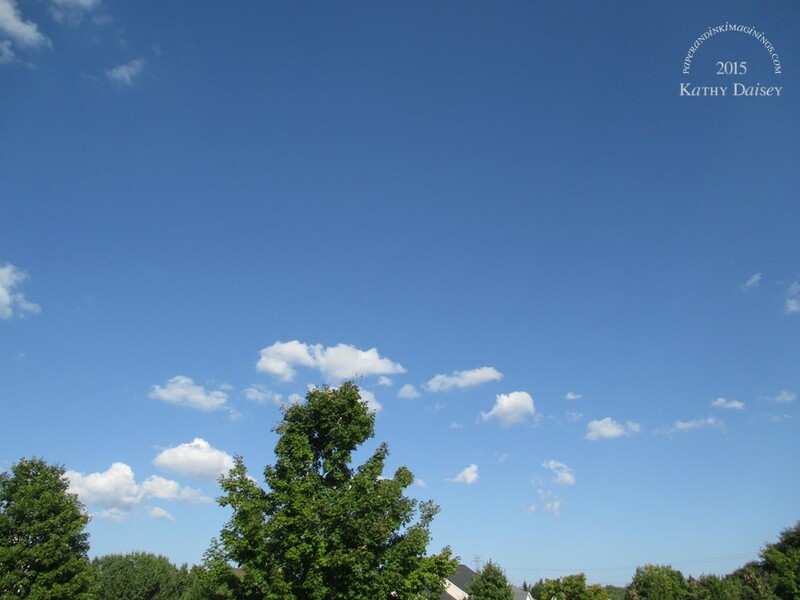 Here is the sky, from my deck, as I am writing this post on September 8th, 2015. Supplies: Stamps – My Favorite Things, Stampin’ Up!, paper – Neenah Classic Crest Solar White, Stampin’ Up! Pear Pizzazz, inks – Stampin’ Up! Crumb Cake, Summer Sun (retired), Tim Holtz/Ranger Distress Ink Tumbled Glass, VersaFine Onyx Black, embossing folder – Provo Craft, die – Taylored Expresssions, embossing powder – Filigree Fine Art Powder clear. Categories: card, encouragement, inspiration | Tags: card, My Favorite Things, Neenah, Provo Craft, Ranger, Stampin' Up!, Taylored Expressions, Tim Holtz | Permalink. Early in July, Offspring3 was pet sitting for a neighbor. The family asked me to pick up their Community Farm Share for that week (Offspring3 not licensed yet). We stopped on the way to Offspring3’s job on a Thursday afternoon, and met the nicest couple working the pickup booth. They had pretzel bread from a local bakery, and I commented that it looked sad (it was in plastic, so the condensation melted the salt). I told them I had a great recipe, and the woman asked me to share. So, the next Thursday rolled around, and I made Brezen Semmel, printed the recipe, and we stopped by the pickup booth again with rolls and the printed recipe. I think the couple was a little surprised that I actually remembered my promise and followed through. This past week, the lovely woman and I got together (not at the pickup booth! 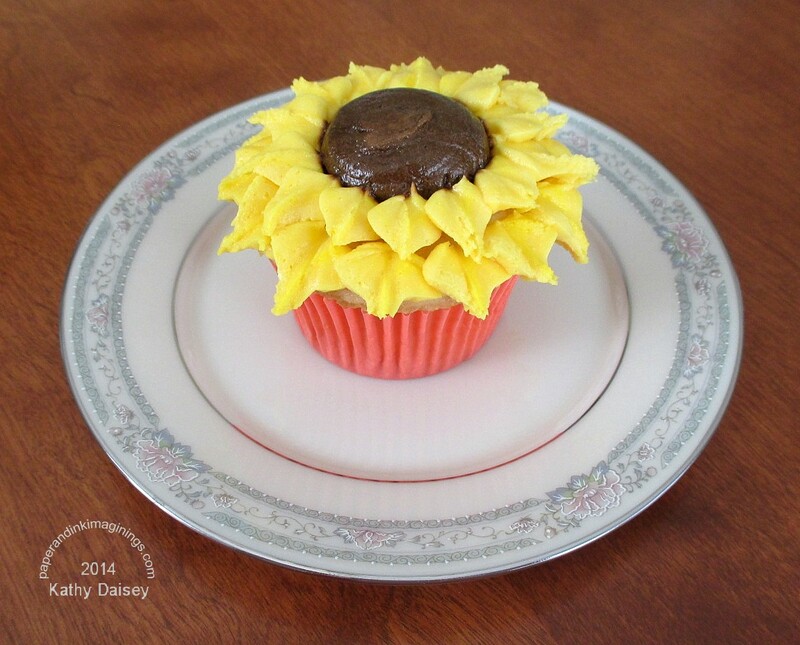 ), and she surprised me with BEAUTIFUL AND DELICIOUS sunflower cupcakes! Holy Guacamole! 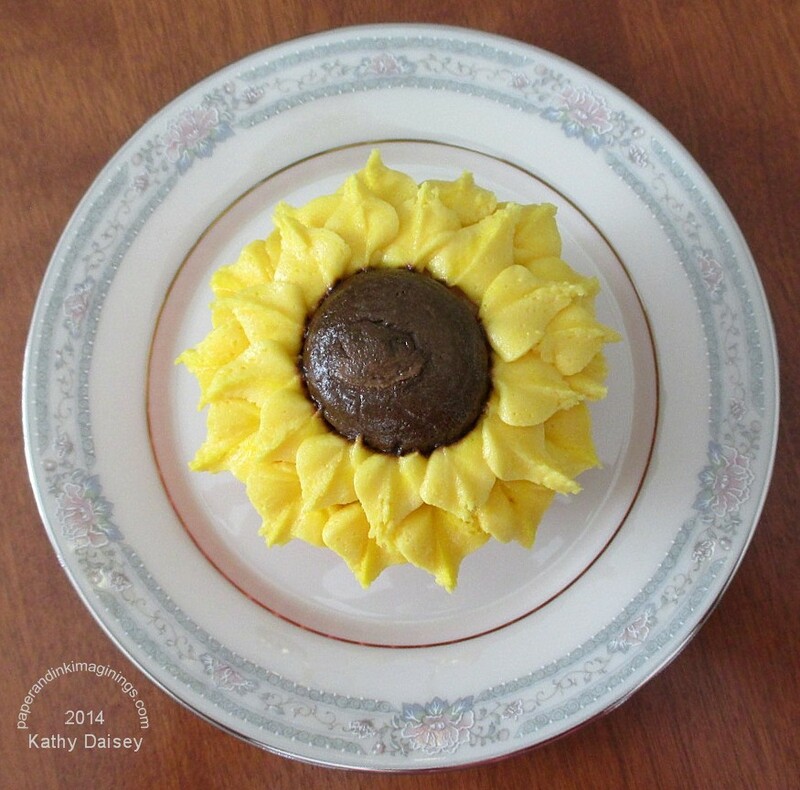 Turns out, my new friend makes cakes as a hobby. Check out her work! Categories: inspiration, thoughts | Permalink.